These mini treats are perfect for parties, entertaining or for weekend baking fun. Brown Sugar Caramel Pecan Cookie Cups. Brown sugar and caramel filling adds a creamy, fudgy texture to cake-like cookie outside. Pecans add a nutty crunch. I think I’m obsessed with pecans in baking. Thanksgiving may have past, but fall is still here to welcome this delicious, nutty flavor. 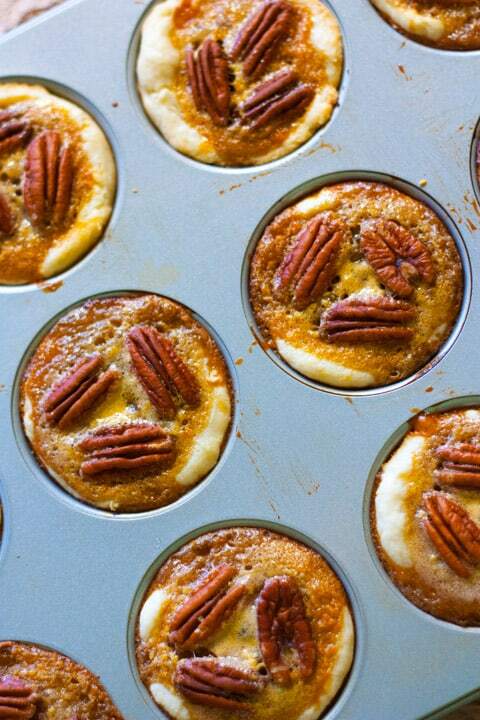 Let these pecan cookie cups bring a little extra joy to your holiday season. These appear like any other cookie cup, but have a sweet surprise when you bite into one. Gooey caramel oozes out to give you an extra sweet delight to your taste buds. 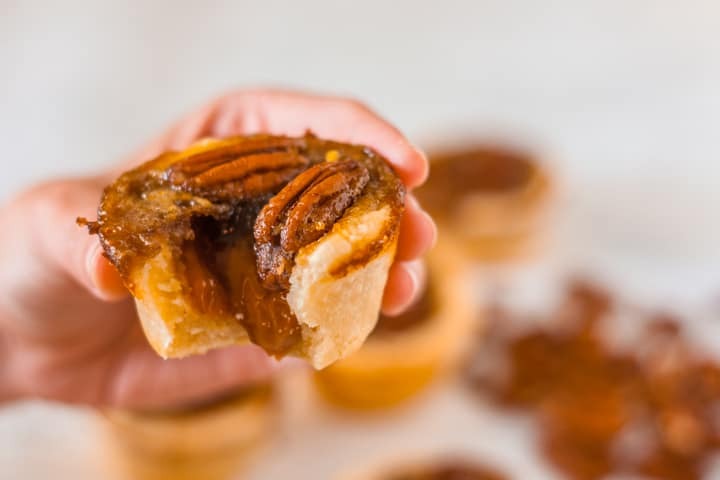 These Brown Sugar Caramel Pecan Cookie Cups are super easy to make and a fun dessert after holiday meals (or anytime). Don’t worry, these are perfectly balanced in flavor. The cookie dough contains no sugar or sweetness, so you get a buttery balance to this wonderful caramel cookie cup dessert. Brown sugar filling adds a creamy, fudgy texture to the cake-like cookie outside. Silky melted caramel mixed with crunchy pecans rounds out this magical flavor bomb in a cookie cup. Should you add cream when melting caramel? Yes, this prevents it from hardening back up during cooling, and instead keeps it soft and chewy. Adding heavy whipping cream to the caramel bits while melting changes the structure of the caramel. Simply grab a piece of chilled cookie dough and roll it into a 1 inch ball. Place it in the muffin pan and press it down, spreading it up the sides evenly to create a cup shape. Make sure it’s not too thin or it will be harder to remove and could crack. I used a muffin or cupcake pan which helps create the shape. Make sure to grease the muffin pan before molding the cookie dough into cups this will make them easy to remove. The butter inside the dough also helps with this. 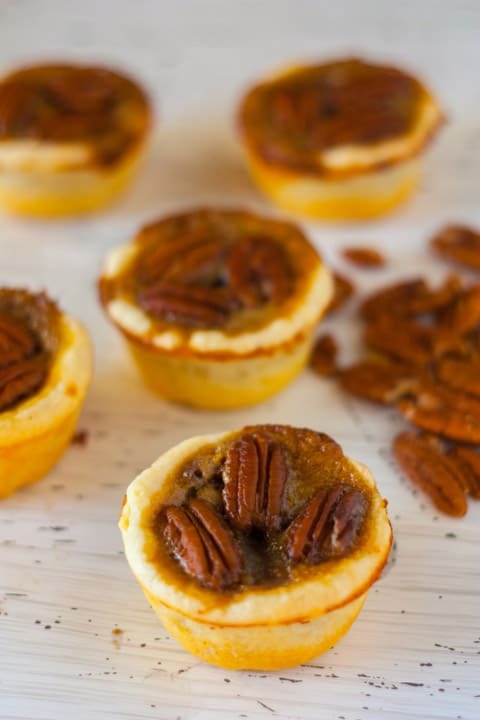 So go ahead and spread some extra holiday joy to your loved ones, friends and family with these Brown Sugar Caramel Pecan Cookie Cups. 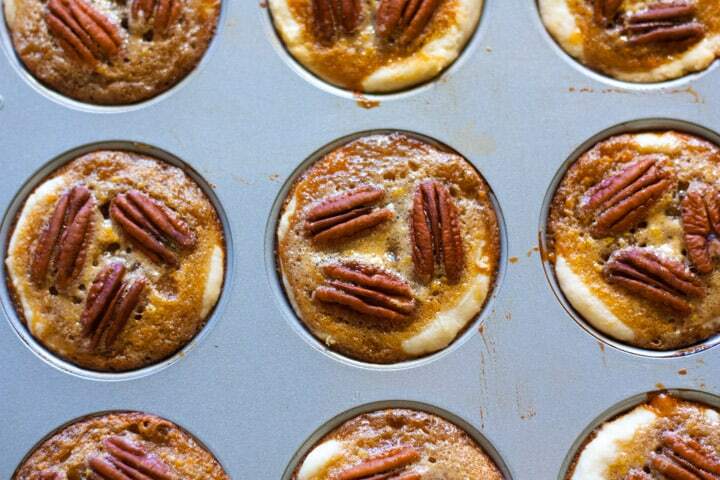 Brown Sugar Caramel Pecan Cookie Cups. Brown sugar and caramel filling adds a creamy, fudgy texture to cake-like cookie outside. Pecans add nutty crunch. For cookie cup: In a large bowl, beat together cream cheese and ¾ cup butter on medium speed until light and fluffy. Gradually add flour, beat on low until just combined and forms to a large ball. Cover and refrigerate for at least 15 minutes to firm up. Preheat oven to 350º F. Roll dough into 1-inch balls. Drop into bottoms of greased muffin pan. Evenly press dough into bottom and up the sides to create cups. For filling: In a small bowl combine brown sugar, eggs and 1-tablespoon melted butter. Spoon filling into cookie cups (should be about ½ full). Top each with 1-2 pecan halves. Place caramel bits and heavy cream into small sauce pan on medium-low heat. Heat, stirring often until combined and melted. Spoon melted caramel over filled cookie cups, almost to top. Then top each with 2-3 more pecan halves (see animated photo in post above). Bake for 20-25 minutes at 350º or until cookie cup edges are golden brown. Cool 3-4 minutes, remove from pan and place on cooling rack to cool before serving. I’m glad you’re obsessed, cause you nailed it with these. Love them! Hi Matt. Thanks and I hope you get a chance to try these wonderful cookies cups.